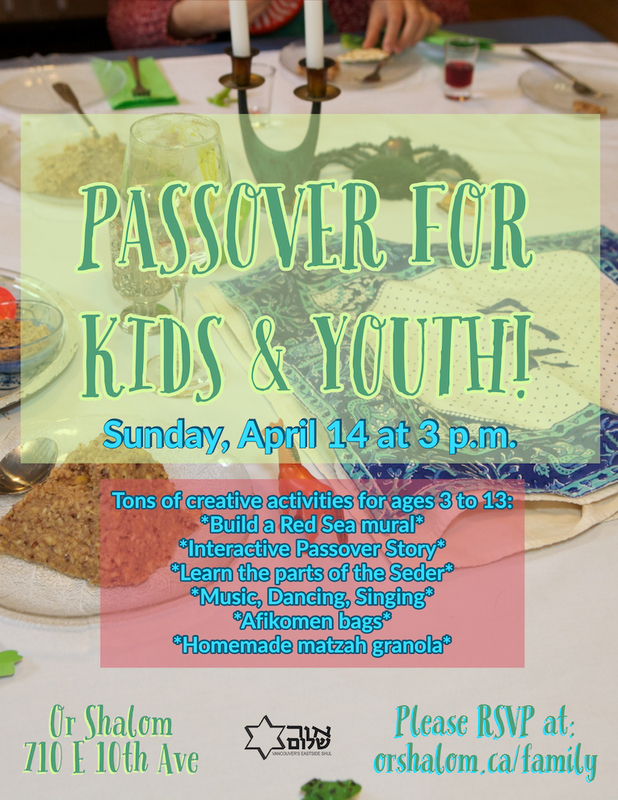 Please fill out the form to RSVP for Or Shalom's Passover for Kids & Youth event on Sunday, April 14. This is a free event! Or Shalom offers a number of programs for families of young children, Bar/Bat/Simchat Mitzvah age, and beyond. Children of all ages are welcome to participate, along with parents, in engaging programs that feature fun and food, and immersion into relevant and inclusive Judaism, from free informal social activities to Shabbat and holiday programs. For children ages 3 to 6 we offer a monthly Shabbat education program, Shabbat Sheli. We welcome your son or daughter’s Bar, Bat, or Simchat Mitzvah with Or Shalom, and have a complete B’nei Mitzvah Program. For post-B’nei Mitzvah teens, check out Philosopher’s Circle. If you have kids between the ages of 7 and 10 and are interested in regular programming for this age group, please let us know. Based on your feedback, parents of young children wanted ways to communicate regularly and get to know one another as well as a way to schedule regular gatherings outside of our monthly Shabbat Sheli program, including in your homes, and in outdoor spaces in Metro Vancouver. We’ve set up an easy-to-use listserv via Yahoo Groups that will facilitate this parent-led connection.Send an email to orshalomyoungfamilies-subscribe@yahoogroups.ca to subscribe to the group.